The Reichskonkordat was signed in Rome as the bells of St. Peter's rang out. Both sides saw themselves as the winners. And both sides were glad to be free of the independent, democratic Catholic Centre Party which had been dissolved during the negotiations. Now the German Catholics were being told it was their Christian duty to support Hitler. standing on the body of a Jewish prisoner. He titled it "The Concordat". The evidence suggests that German Catholics — a third of the population — were marshalled to support Hitler through a top-down operation directed by the Vatican. After that, everything quickly fell into place. Hitler seized power through the Enabling Act of 24 March 1933, which suspended democratic rule. He did this with the help of the Catholic Centre Party, which then got out of his way by dissolving itself, That let Hitler suspend democratic freedoms "until further notice" and the Nazi terror began. The concordat, which would normally have taken years, was negotiated, signed and ratified well before the end of the year. 1933, as part of negotiations for the Concordat. The "concomitants" — what would today be called "collateral damage" — were the destruction of democracy, mounting terror and the beginning of a campaign of genocide. The Vatican's "great aim" included got the concordat that previous, democratic, German governments had refused to grant. This marriage of convenience between Hitler and the Church hierarchy was deeply confusing to German Catholics who looked to their church for guidance. 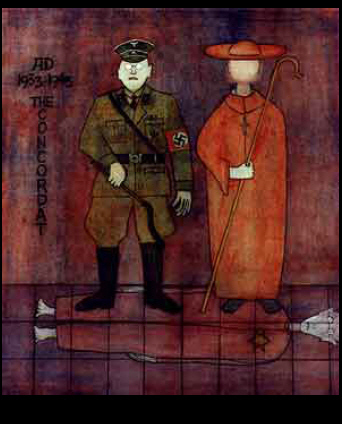 Hitler’s 1933 election posters for Catholics told them that it was their religious duty to support his party, and the Church did nothing to counter this impression. "Put yourself in the position of a 1933 German Catholic as you read the text of the Concordat between Nazi Germany and the Vatican, the Reichskonkordat. "The German Catholic Church has rescinded its ban on joining the Nazi Party. The Catholic Centre party has dissolved itself. [And Articles 31 and 32 prevent any revival of this democratic Catholic party which had opposed the Nazis.] In the Reichskonkordat, the Vatican has promised that German Bishops and their subordinates will be obedient to and honour the Nazi state (Article 16). It has promised that German Catholic educators will teach children patriotic love for the Nazi state (Article 21). It has requested and received the Nazi dictatorship's promise to enforce internal Church decisions (Article 10). 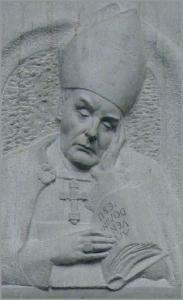 Cardinal Bertram of Breslau has called on Catholics to avoid all subversive or illegal (by Nazi definition) activities. In other words, the impetus for the Catholic faithful to follow Hitler came from above. After the war the concordat was cleverly anchored in the new German Constitution. Article 123.2 says that "State treaties concluded by the German Reich" must be honoured so long as these concern areas which fall under the competence of the individual German states. Later the papal nuncio complained to the Federal Government that Lower Saxony was not complying with some provisions of the Concordat. Although the states of Hesse and Bremen also wanted to scrap the concordat, the Federal Government supported the nuncio by bringing the matter before the Constitutional Court. After WWII the Allied Powers took the precaution of decentralising Germany by making the powers of the federal states (Länder) very wide, even letting them share jurisdiction with the national government in key areas like finance. And so it was meant to remain, for Art. 79.3 of the Constitution explicitly forbade any future change in the division of the Federation into Länder and any change in their powers. Germany is constitutionally locked into decentralisation — and also into the 1933 concordat. The broad legal competencies given to the individual German states by the 1949 Constitution encompass key areas of interest to the Church such as culture, education, social services and (some aspects of) finance. This allows the states to take over these parts of the Hitler concordat, thus preserving most of the last surviving concordat with a Fascist government. This has also made the concordat unassailable without a constitutional upheaval and has served to build it into the fabric of German law. The concordat includes the Secret Supplement. Naturally, this is omitted on Catholic sites because it shows that by 1933 the Vatican knew that Hitler was going to re-arm in defiance of the Treaty of Versailles, and the Church wanted to help him keep it secret. In fact, the Secret Supplement of the Austrian concordat indicates that two years earlier the Vatican was already planning for this eventuality. This helps to explain Pius' shabby treatment of the Poles. After the invasion of Poland by the Germans the Vatican broke the Polish Concordat by appointing a foreign bishop — a German, no less — over a part of Polish territory. In the minds of many this helped to legalise the German occupation. In fact, it has been argued that the Vatican supported the Nazis and viewed their planned conquest of Catholic Poland as collateral damage. This is because the German 1941 military campaign against Russia, if successful, would have opened up the prospect of the conversion of Russia to Catholicism. Thus the Secret Supplement, which quietly provided for an illegal German re-armament, looks like a very shrewd piece of Vatican strategy. See also: Highlights from the long history of Christian anti-Judaism: compare Canon (Church) Law and Nazi antisemitic measures. der Päpste im Zeitalter der Weltkriege (1982/83). 3. James Carroll, Constantine's Sword: The Church and the Jews - A History, 2001, p. 498. 5. Quoted in Guenter Lewy, The Catholic Church and Nazi Germany (2000), pp. 25-26. Subject to all rights and objections of interested parties, treaties concluded by the German Reich concerning matters within the legislative competence of the Länder under this Basic Law shall remain in force [...]. A selection (minus footnotes) from Karlheinz Deschner's Ein Jahrhundert Heilsgeschichte. Die Politik der Päpste im Zeitalter der Weltkriege, 1982/83, v. 1 & 2.